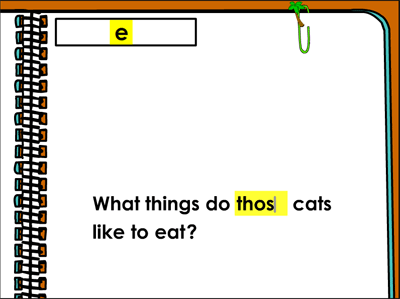 After being introduced, in Level 1, to characters (such as kids and animals) and key properties of those characters, Level 2 increases the complexity of the writing to introduce more multi-syllable words, longer sentences, more sentences on a page and some unique features of text such as quotations and the punctuation they require. This level also offers pages of text unaccompanied by pictures - a key feature of more advanced books. 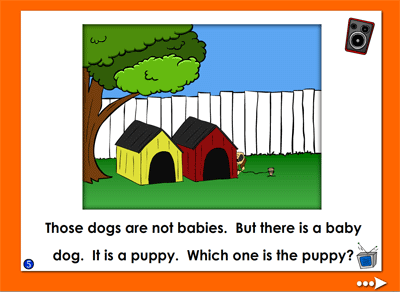 Here is an example of teaching the word "puppy" through the Savvy Sounds format which develops the critical skill of sound blending. In "sounding out," it is not enough to put a sound on each letter. To arrive at words, the individual sounds have to be blended together -- a difficult process for many children. Savvy Sounds eases these hurdles by having the program contribute to the blending process. For example, for a word like puppy, the computer will show and say the first part of the word (e.g. "pup"). Then the screen shows a set of words and while the audio says the target word (e.g. "puppy"), the child has to select it. 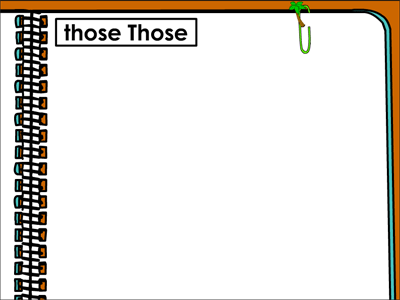 Here is an example of teaching the super sight word "those" through the Write In to Read format. (Super sight words are a group of about 100 words - all of which are taught in the Reading Kingdom - which occupy 50%-60% of every page of text in the English language.) While it's difficult to offer a definition of these words, it is possible to teach their meaning. 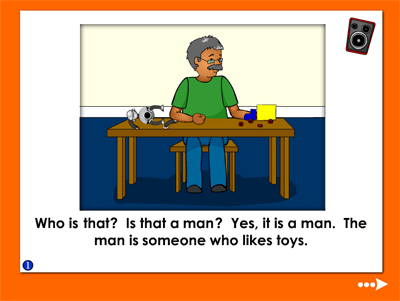 Write in to Read does this by carefully pairing words and graphics. 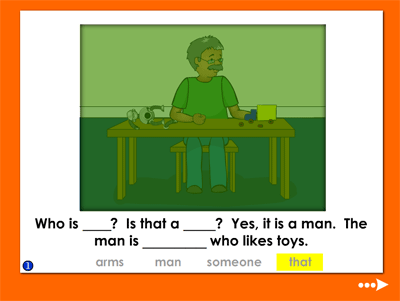 For example, in learning the word "those" the child first sees a sentence where the word has to be inserted. The sentence is followed by a graphic that illustrates its meaning. Then guided by audio instructions, the child has to type some or all of the words in the sentence -- including its punctuation. After learning all the words in a book, children are given the book to read and/or have read to them by the program. Level 2 has 6 books. Here is a sample page from Book 9.